Investigators examining the cause of a blaze at the Littlewoods Pools building believe it was started deliberately. The fire took hold shortly before 20:00 BST on Sunday and the roof and upper floor of one wing are feared to have been lost. A joint investigation between Merseyside Police and Merseyside Fire and Rescue Service has been launched. Fire crews are assessing the extent of damage and structural safety of the art deco building. The blaze is under control and Merseyside Police said there had been no injuries. Merseyside Fire and Rescue Service said 50 firefighters from six fire engines and three support pumps dealt with the blaze at its height. It said crews had smashed wooden panelling used to board up windows to access the fire on the upper floors. Just over 12 weeks ago plans were announced for a major new complex at the five-storey site on Edge Lane, including film and TV studios - although the part of the building earmarked for the studios was unaffected by the fire. The deal, signed with developer Capital & Centric, intends to create a £50m northern base for Twickenham Studios, with the creation of hundreds of jobs. 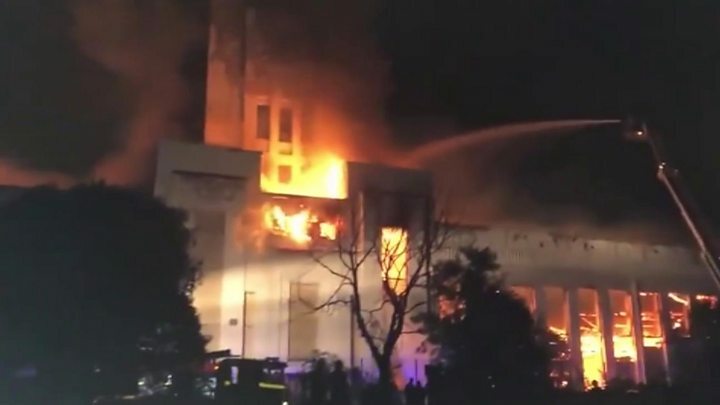 Adam Higgins, co-founder of Capital & Centric, said the blaze had started in the roof of the west wing, which is known for its distinctive clock tower. "While there is damage to the floor and roof, the walls of the west wing and overall structure seem intact," he added. "We'll know more once we can get inside, but we're extremely hopeful we'll be able to save the iconic structure." The building was part of Sir John Moores' Littlewoods empire, which included the weekly football pools coupons played by millions, as well as the high street stores around the country. A number of redevelopment plans had been discussed for the site in recent years but had fallen through.